4 Clubhouses in Whatcom County with the need of a better structured site tailored for Whatcom families needing to find information quickly. 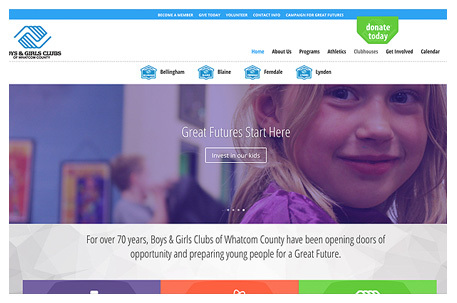 The Boys & Girls Club of Whatcom County newly redesigned website offers quick access to essential information highlighting upcoming events right from the homepage and features that displays a more comprehensive insight to what parents are searching for most. The new website has a clean uncluttered design, improved functionality and custom designed icons for intuitive image recognition with a mobile-friendly solution.